Children (and even adults) learn best and retain more vital information when all of their senses are active and engaged. That said, a water or sand table, or “sensory table” or bin is the perfect way to enlighten and entertain your little one for hours of creative, educational play. Your sensory table can be as simple or as elaborate as you like. 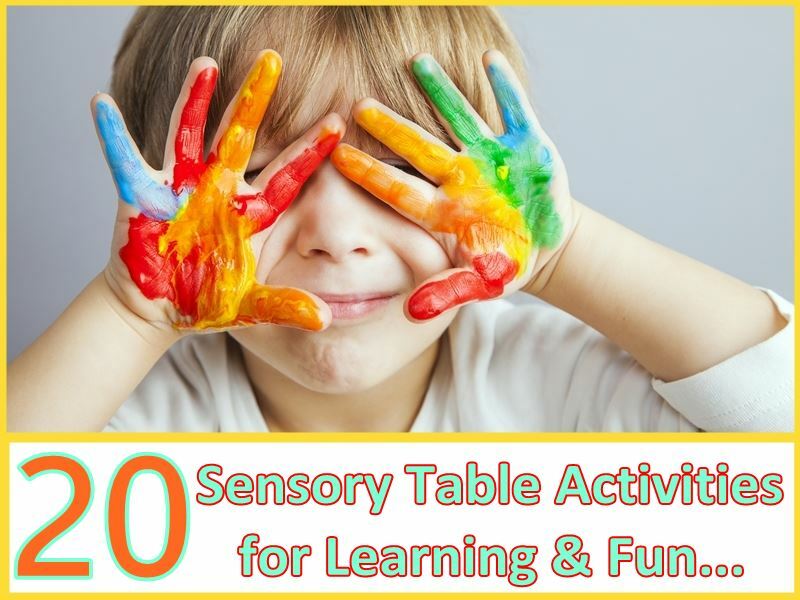 Some popular sensory table activities include safe edible finger paints, slimy goop or slime, loose sand, and even plain ol’ H20. The real point isn’t how you set it up, but how you allow your child to explore materials and themes with no preconceived knowledge or major goals in mind. Kids who are allowed to investigate a sensory experience mostly on their own will develop and refine their cognitive, social and emotional, physical, creative and linguistic skill sets. Keep reading to see a slideshow of 20 fabulous educational, creative sensory table (or bin) experiences perfect for your toddler. Safety Note: Sensory tables often make use of small objects that may not be suitable for your baby or young toddler. If your little one is still tossing everything into his mouth, don’t use small toys, grains or nuts and so on, in your sensory table set-ups and offer supervision as well. Oh, and if you need some inexpensive ideas about the actual sensory table, check out the links below. Tots will love to swirl this rainbow colored foam around or run toys through it. Made with washable, non-staining, liquid watercolors, dish soap and water, this colorful foam offers tons of fun playtime. Also try these rainbow bubbles. 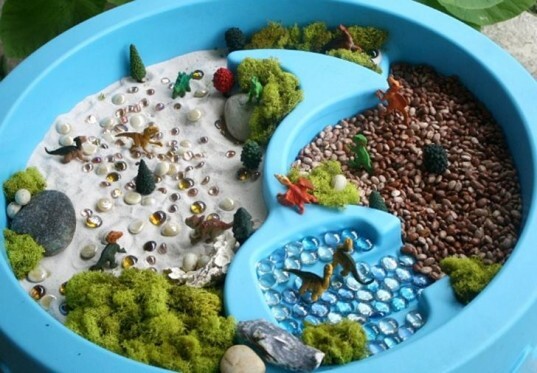 Teach your child all about dinosaurs and other prehistoric life with this creative dino playscape idea. Use sand, clay, dried beans, glass beans, rocks, tiny dino toys, plants and more to create this prehistoric world and add to the learning by reading a book about dinosaurs. See more small world ideas here. Marshmallow themed activities may give you pause – because seriously, who wants their kiddo munching down a mountain of sugar? However, if you pour marshmallows into a sensory bin and add water, you’ll be amazed at the fluffy fun. Kids love playing with plain old rice in a sensory bin, but you can expand the learning and sensory experience with scented rice. In the image above, the bin is full of lemon scented (and colored) rice, but you can also try cotton candy, gingerbread, mint, banana, apple and other scented rice in your bin. See some scented rice recipes here. This awesome scented ice cream sensory table idea offers hours of entertainment for kids – especially when you add sprinkles. Grab your play dishes, pretend ice cream cones and let your kids scoop up some fun. Got a kid obsessed with pink? Then this sensory bin activity is sure to please. Packed with pink and white rice, colorful shiny beads and fabric rose petals, this hyper pink bin can be used with toy fairies, little gnomes or other toys for hours of creative pink play. 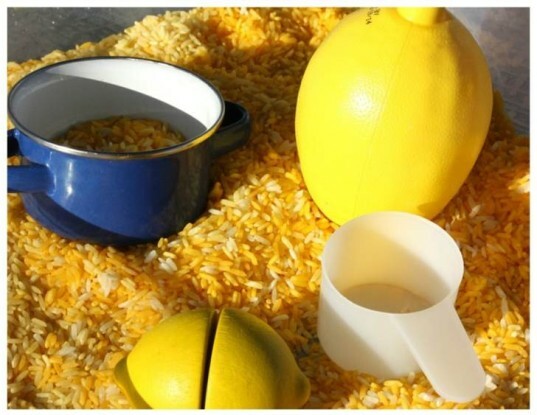 A basic rice sensory table can offer hours of fun and learning, with very little effort. 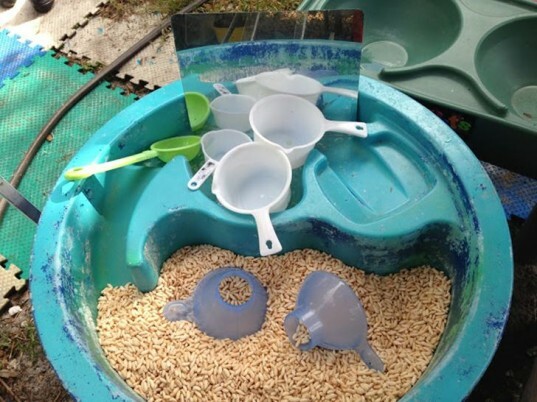 Young toddlers are absolutely enthralled with rice play. They can dig, pour, bury and swirl rice easily for a super fun tactile experience. This wonderful Glowing Oobleck table is surprisingly safe and non-toxic for kids and of course super exciting for little ones. You can use this mix in the bathtub or on a sensory table in a dark room or even outside at night. What kid doesn’t love to smash and smoosh gelatin with their little hands?! The rainbow colors add another layer of fun and this recipe is safe even if kids put some in their mouth. Vegans: see our recipe for non-gelatin jigglers here. If your child enjoys reading lots of books about frogs or is tadpole obsessed, then this educational frog life cycle table is a perfect fit. 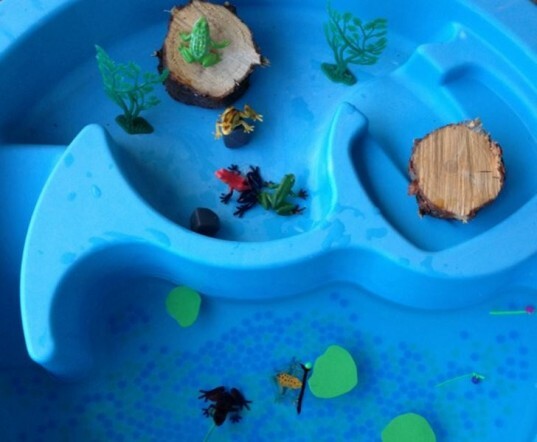 This project is also a great idea for homeschoolers learning about frogs, lakes or swamps. Get out your play kitchen gear, some fun cake toppings (think sprinkles and play fruit) and get baking with this clever baking sensory table activity. This “dough” is easy to hold and can be re-molded over and over again for limitless cupcakes, cookies and more that chef-minded kids can decorate. 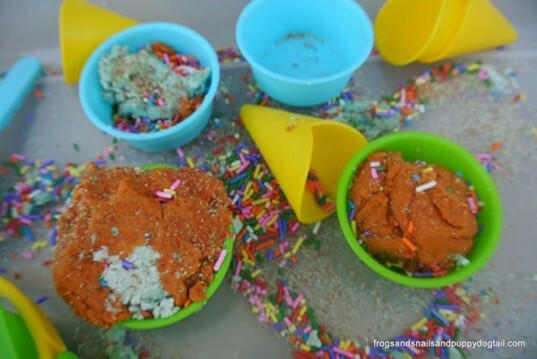 This muddy racing sensory table is not for the faint of heart, but if you’ve got the guts to make a BIG mess, this activity is sure to please most kids. You can use this “mud” for car racing, toy bugs and any number of other activities including teaching your kids about animals who dwell in the mud. 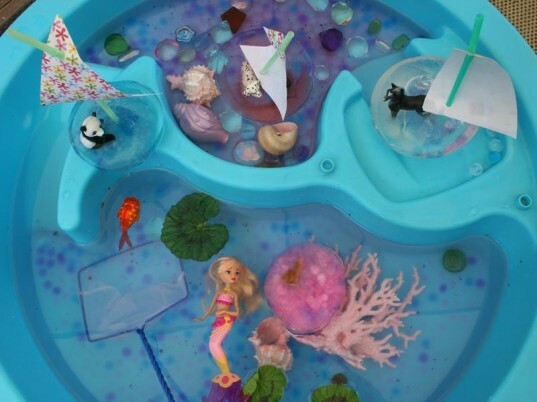 When summer hits and the heat sets in, nothing is cooler than fun ice boats in the water table. You can color your ice boats plus add little ice-minded animal toys. Your kids will adore floating the ice boats around until they melt away. If you’re on a tight budget, the bulk section of your grocery store will yield many inexpensive sensory table items. From rice grains to brown rice cereal to pasta to very loose grains like flour (if you’re brave enough to deal with a mess) and much more. Just add some tongs, scoops, measuring cups of various types and sizes, water pitchers with spouts and big spoons and your toddler will spend hours scooping, pouring and mixing grains in the bin. No idea how to use those plastic Easter eggs? Add them to your sensory table with grass, beads, colorful pompoms, tongs and some egg cartons and you’ve got the perfect post (or pre) holiday sensory table event. 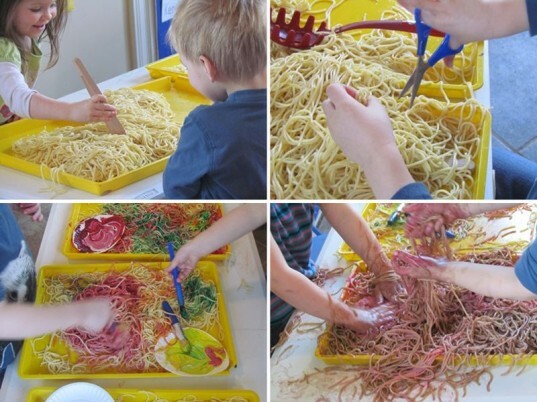 A spaghetti sensory table is wet, messy and tons of fun. Add traditional noodle scoops, tongs, scissors and other pasta tools for a whole day of fun. You can even paint the noodles offering a total exploration of color, texture, sensory, and fine motor play for tots. No matter the season, you can celebrate with seasonal themed activities as seen in this and the next three slides. For winter, try a icy cool snow dough and polar bear theme, add some winter word recognition aspects to a winter-themed bin or create an entire polar region sensory table. Spring is the perfect season for a gardening themed sensory table. Try a beautiful and educational seed and flower table or even a whole veggie garden table. There are endless summer minded sensory tables you can create. Consider a beach or ocean theme, camping table or a bug counting bin. Fall sensory bins can be very creative due to all the beautiful autumn leaves, but don’t stop there. Add tiny pumpkins, cinnamon sticks, acorns, tree branches, and much more that may appeal to kids in the fall. Children (and even adults) learn best and retain more vital information when all of their senses are active and engaged. That said, a water or sand table, or "sensory table" or bin is the perfect way to enlighten and entertain your little one for hours of creative, educational play. Your sensory table can be as simple or as elaborate as you like. Some popular sensory table activities include safe edible finger paints, slimy goop or slime, loose sand, and even plain ol' H20. The real point isn't how you set it up, but how you allow your child to explore materials and themes with no preconceived knowledge or major goals in mind. Kids who are allowed to investigate a sensory experience mostly on their own will develop and refine their cognitive, social and emotional, physical, creative and linguistic skill sets. Keep reading to see a slideshow of 20 fabulous educational, creative sensory table (or bin) experiences perfect for your toddler. 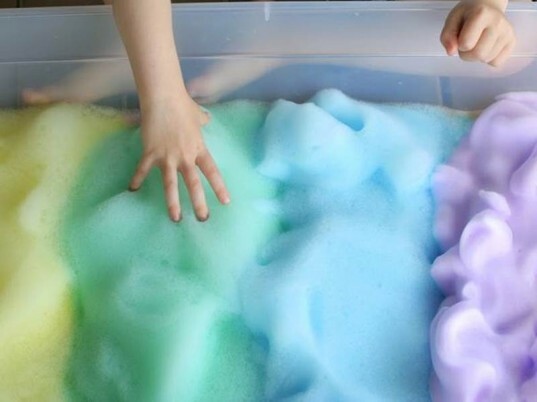 Rainbow Foam Sensory Table Tots will love to swirl this rainbow colored foam around or run toys through it. Made with washable, non-staining, liquid watercolors, dish soap and water, this colorful foam offers tons of fun playtime. Also try these rainbow bubbles. Dino Playscape Sensory Table Teach your child all about dinosaurs and other prehistoric life with this creative dino playscape idea. Use sand, clay, dried beans, glass beans, rocks, tiny dino toys, plants and more to create this prehistoric world and add to the learning by reading a book about dinosaurs. See more small world ideas here. 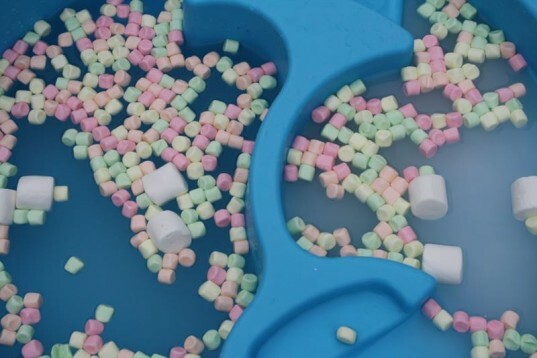 Marshmallow Sensory Table Marshmallow themed activities may give you pause - because seriously, who wants their kiddo munching down a mountain of sugar? However, if you pour marshmallows into a sensory bin and add water, you'll be amazed at the fluffy fun. Olfactory Sensory Table Kids love playing with plain old rice in a sensory bin, but you can expand the learning and sensory experience with scented rice. In the image above, the bin is full of lemon scented (and colored) rice, but you can also try cotton candy, gingerbread, mint, banana, apple and other scented rice in your bin. See some scented rice recipes here. Scented Ice Cream Sensory Table This awesome scented ice cream sensory table idea offers hours of entertainment for kids - especially when you add sprinkles. Grab your play dishes, pretend ice cream cones and let your kids scoop up some fun. 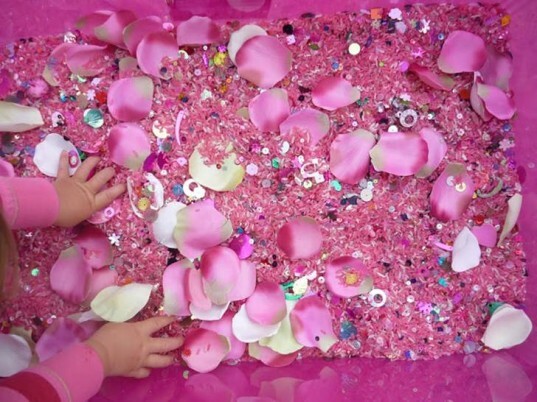 Pink Fairy & Flower Sensory Table Got a kid obsessed with pink? Then this sensory bin activity is sure to please. Packed with pink and white rice, colorful shiny beads and fabric rose petals, this hyper pink bin can be used with toy fairies, little gnomes or other toys for hours of creative pink play. Rice Sensory Table A basic rice sensory table can offer hours of fun and learning, with very little effort. 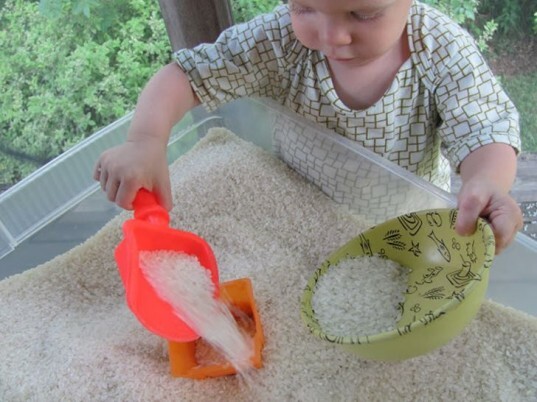 Young toddlers are absolutely enthralled with rice play. They can dig, pour, bury and swirl rice easily for a super fun tactile experience. 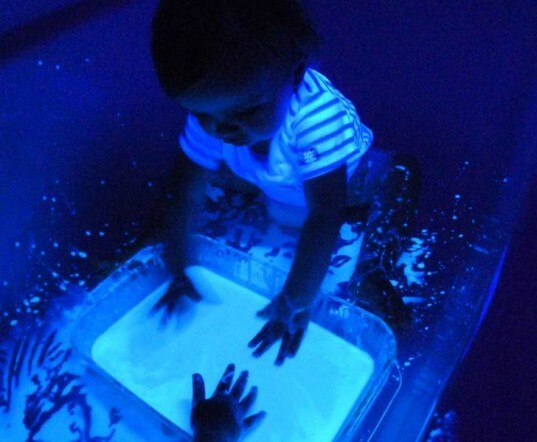 Glow in the Dark Sensory Table This wonderful Glowing Oobleck table is surprisingly safe and non-toxic for kids and of course super exciting for little ones. You can use this mix in the bathtub or on a sensory table in a dark room or even outside at night. 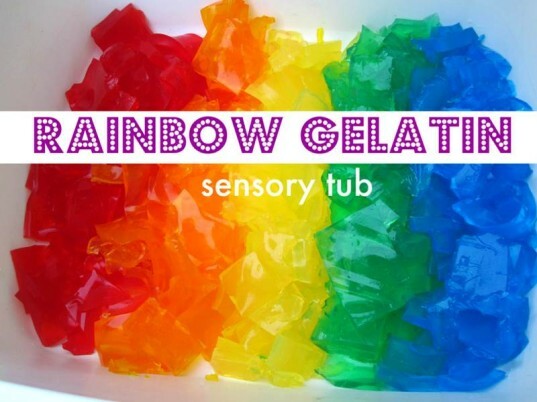 Rainbow Gelatin Sensory Table What kid doesn't love to smash and smoosh gelatin with their little hands?! The rainbow colors add another layer of fun and this recipe is safe even if kids put some in their mouth. Vegans: see our recipe for non-gelatin jigglers here. Frog Life Cycle Sensory Table If your child enjoys reading lots of books about frogs or is tadpole obsessed, then this educational frog life cycle table is a perfect fit. This project is also a great idea for homeschoolers learning about frogs, lakes or swamps. 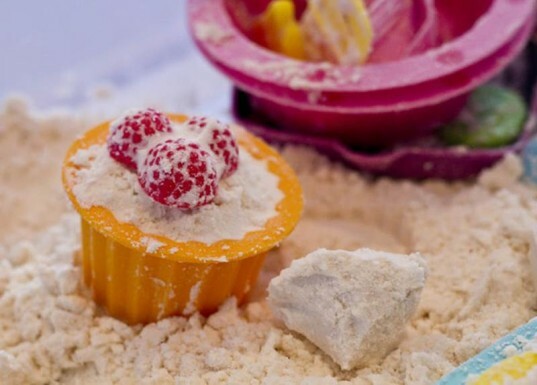 Baking Sensory Table Get out your play kitchen gear, some fun cake toppings (think sprinkles and play fruit) and get baking with this clever baking sensory table activity. This "dough" is easy to hold and can be re-molded over and over again for limitless cupcakes, cookies and more that chef-minded kids can decorate. Muddy Race Car Sensory Table This muddy racing sensory table is not for the faint of heart, but if you've got the guts to make a BIG mess, this activity is sure to please most kids. 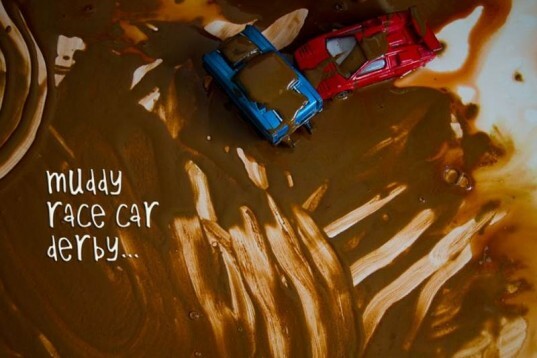 You can use this "mud" for car racing, toy bugs and any number of other activities including teaching your kids about animals who dwell in the mud. Ice Boats Sensory Table When summer hits and the heat sets in, nothing is cooler than fun ice boats in the water table. You can color your ice boats plus add little ice-minded animal toys. Your kids will adore floating the ice boats around until they melt away. Cereal & Grains Sensory Table If you're on a tight budget, the bulk section of your grocery store will yield many inexpensive sensory table items. From rice grains to brown rice cereal to pasta to very loose grains like flour (if you're brave enough to deal with a mess) and much more. Just add some tongs, scoops, measuring cups of various types and sizes, water pitchers with spouts and big spoons and your toddler will spend hours scooping, pouring and mixing grains in the bin. Easter Sensory Table No idea how to use those plastic Easter eggs? 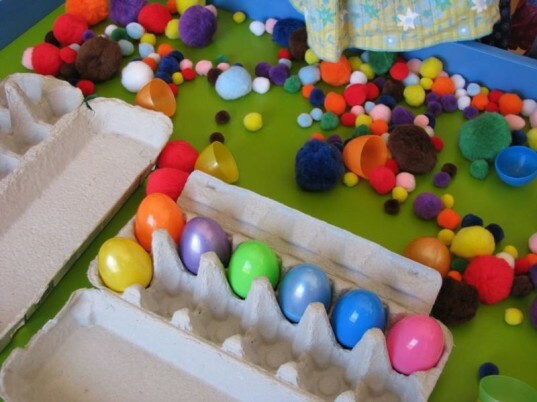 Add them to your sensory table with grass, beads, colorful pompoms, tongs and some egg cartons and you've got the perfect post (or pre) holiday sensory table event. Spaghetti Sensory Table A spaghetti sensory table is wet, messy and tons of fun. Add traditional noodle scoops, tongs, scissors and other pasta tools for a whole day of fun. You can even paint the noodles offering a total exploration of color, texture, sensory, and fine motor play for tots. Winter Sensory Table No matter the season, you can celebrate with seasonal themed activities as seen in this and the next three slides. 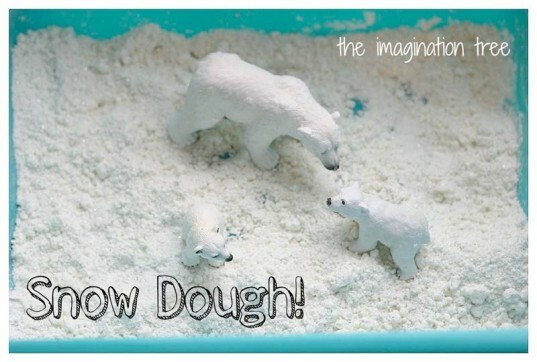 For winter, try a icy cool snow dough and polar bear theme, add some winter word recognition aspects to a winter-themed bin or create an entire polar region sensory table. 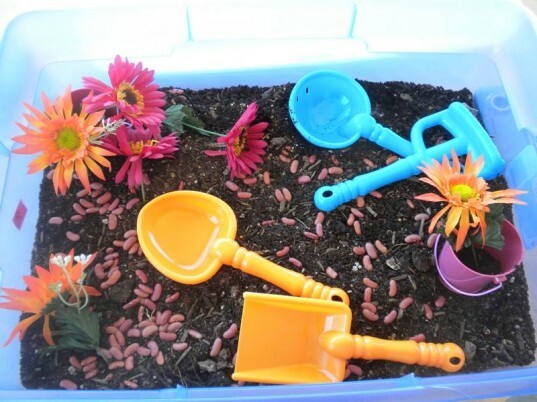 Spring Sensory Table Spring is the perfect season for a gardening themed sensory table. Try a beautiful and educational seed and flower table or even a whole veggie garden table. 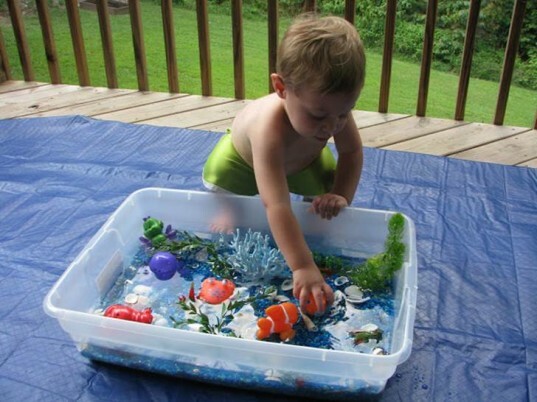 Summer Sensory Table There are endless summer minded sensory tables you can create. Consider a beach or ocean theme, camping table or a bug counting bin. 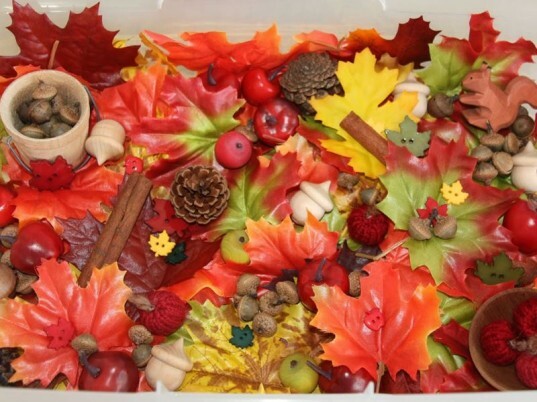 Autumn Sensory Table Fall sensory bins can be very creative due to all the beautiful autumn leaves, but don't stop there. Add tiny pumpkins, cinnamon sticks, acorns, tree branches, and much more that may appeal to kids in the fall.